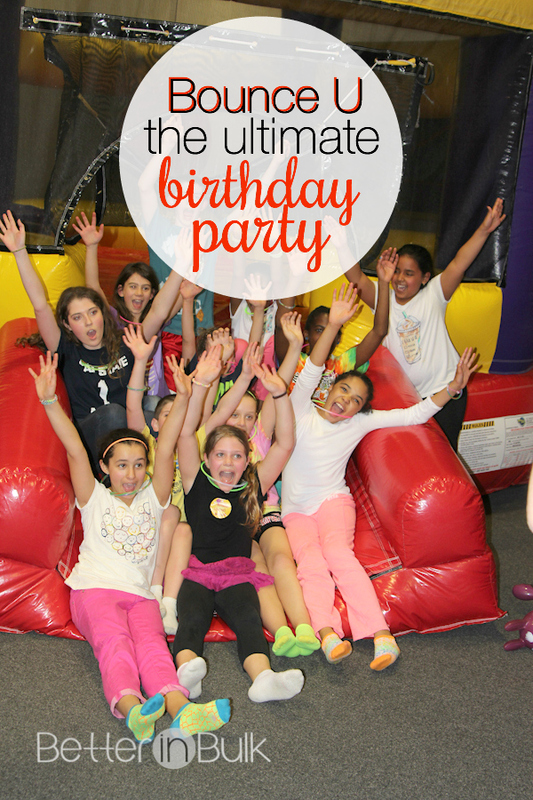 You are here: Home / Family life / Holidays & Celebrations / Bounce U: The Ultimate Birthday Party! We were invited by our local Bounce U location to celebrate my daughter’s 11th birthday with a few friends. Although the party was complimentary, all thoughts, opinions, and photos are my own. I’m not much of a party-planning person. I love the idea of celebrating each of my five kids’ birthdays, but the thought of planning a party (and everything that goes in to running a successful party) stresses me out. 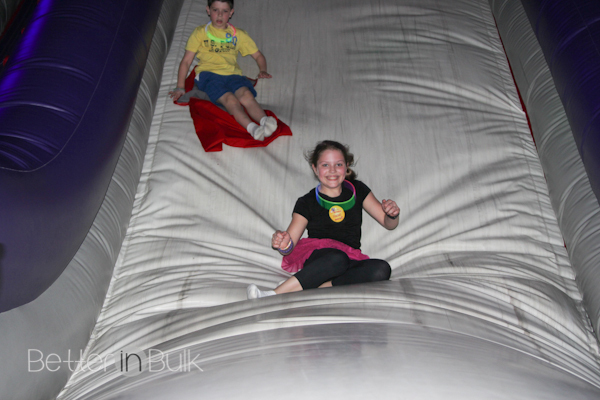 So when Bounce U contacted me about hosting a party at one of their nearby locations – just weeks before my youngest daughter turned 11 – I couldn’t believe my luck! My kids have attended Bounce U parties before and the response is always that Bounce U is the ULTIMATE birthday party location. Reese was beyond excited when I told her that she could invite a dozen of her friends to her very own Bounce U party this year. Not only were we able to book a party for her, but we were able to get the special Cosmic Bounce (where they turn out the lights and turn ON the black lights. They gave each of the kids glow necklaces (I brought a few extras from the dollar store) and everyone glowed! 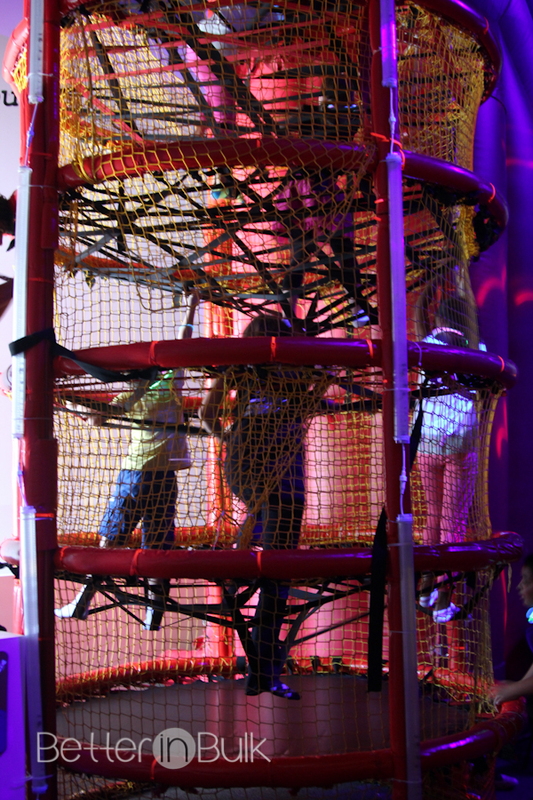 It was a fun dimension to their party, for sure – perfect for a group of giggling 11-year-old girls! • The kids have an absolute blast and wear themselves out with physical activity that does include tearing your house apart. Climbing, bouncing, sliding, balls, games, you name it! 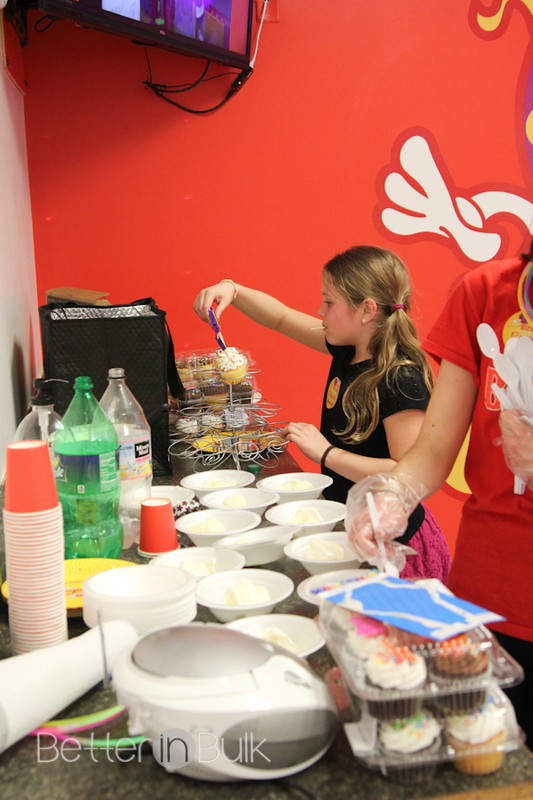 • Bounce U party pros run the whole party for you, from gathering presents and coats at the beginning through getting on the equipment and bouncing with the kids to scooping out the ice cream and serving the kids. They even loaded all of the presents into my car at the end. • No clean up or set up. No messy house. No chocolate cake ground into my living room carpet. 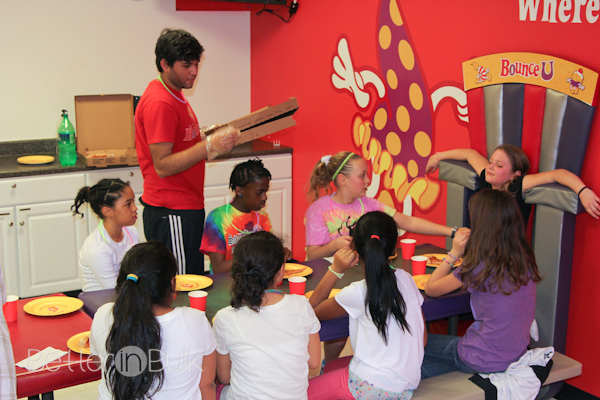 • Bounce U will get everything for you – from decorations to pizza for the kids and grown up food for the parents. And goody bags (and these are goody bags that kids actually want!). • A stress-free birthday party experience for everyone. • Bounce U goes beyond birthdays. 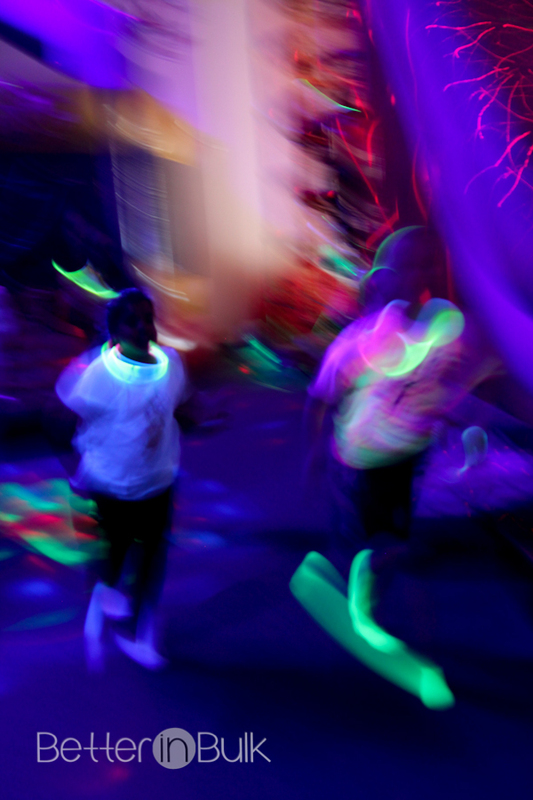 The fun includes Parent’s Night Out (drop the kids off for some supervised fun! 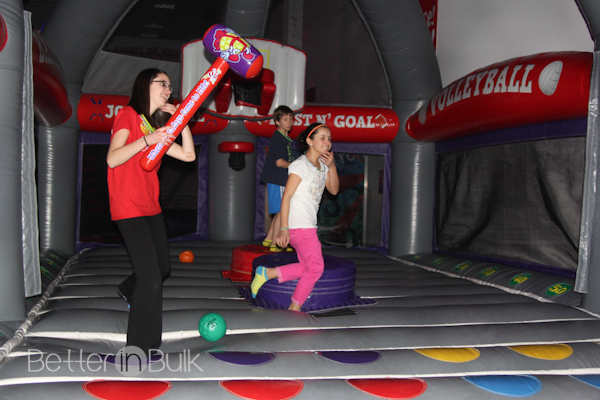 ), Open Bounce, camps, fund raisers, team parties, and more. We were extremely impressed with the helpfulness and patience of the two party pros that helped with our party. They took pictures through the entire party which they played during pizza and cake time in the party room (the pictures are also available for purchase on a disk so you don’t even have to worry about taking pictures if you don’t want to). I noticed quite a bit of 11-year-old flirting with the male party pro (mostly in the form of hitting him with the blow up hammer) and he didn’t even blink and eye. What a great sport! he didn’t even miss a beat. We opted to bring our own cupcakes and ice cream, but you can also order cake or cupcakes and ice cream from Bounce U before your party and they’ll have it ready for you on party day. I just loved that I didn’t have to run back and forth serving cake, scooping ice cream, or pouring drink refills. We really could just sit back and relax and ENJOY the party. 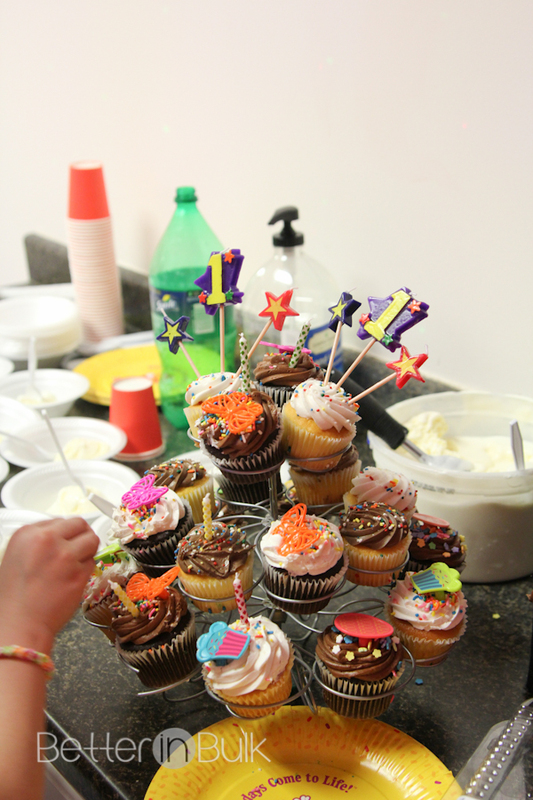 Our party pros scooped ice cream while they helped the birthday girl decorate the cupcake tower (which they had!) and insert all 30-something candles. 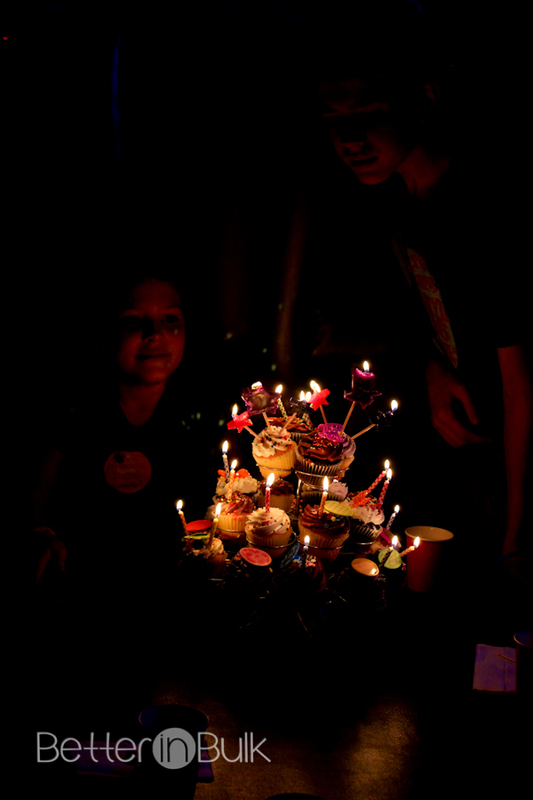 I never would have braved lighting all of those candles, but they were awesome! And, no, she didn’t blow them all out in one breath! 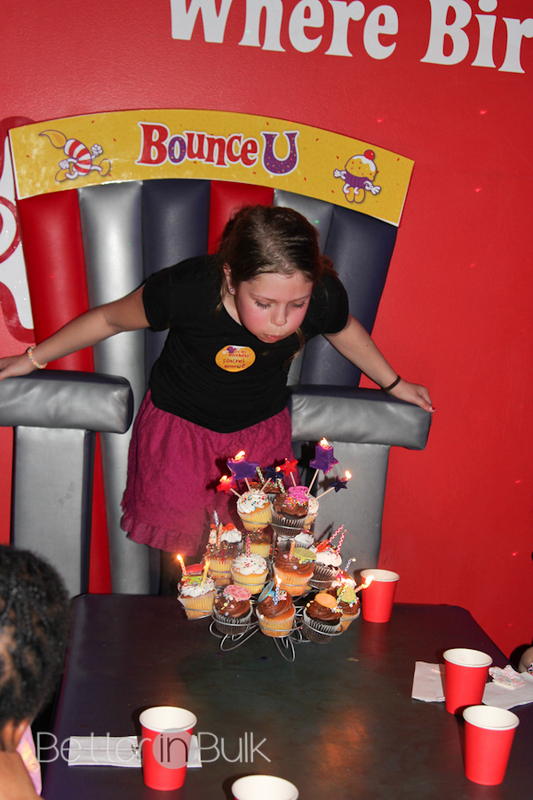 Have you ever been to a birthday party at Bounce U? What are your favorite kind of kid birthday parties? 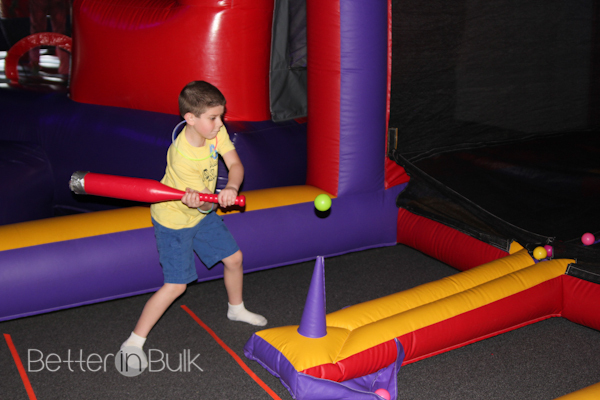 Find a Bounce U location near you! What – an entire area of bounciness?! My daughter would love it. These look like so much fun. This looks like a good time! My little guy can’t bounce enough, so this is a fun idea for him. This looks so much fun! Wish I woulda had a bday party like this as a kid! 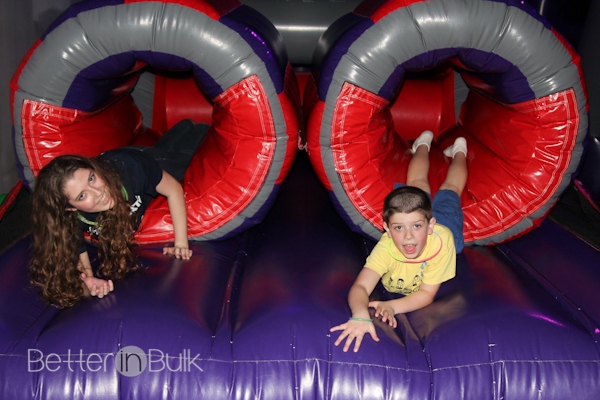 Some of the best birthday parties we’ve been to have been at Bounce U facilities. Thank you for sharing – I can almost bet we’ll be organizing a b’day party there soon. This looks like such a fun party! We love Bounce House parties. The kids have so much fun and get out a ton of energy.